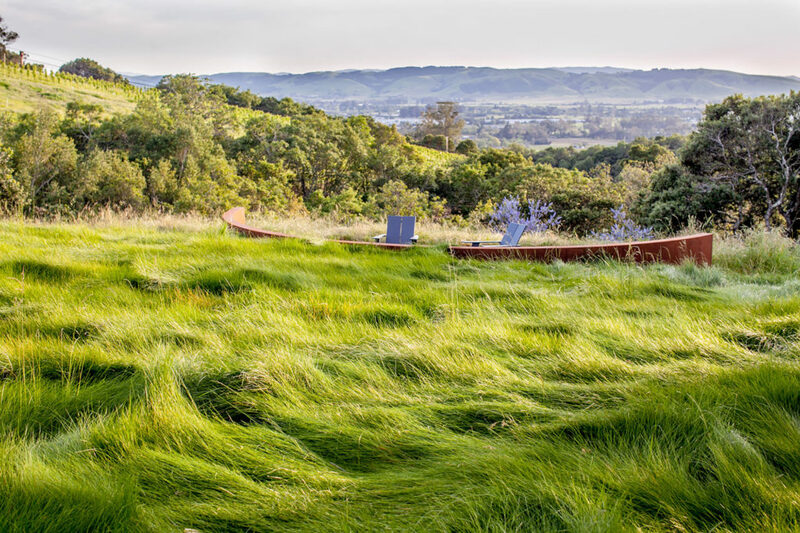 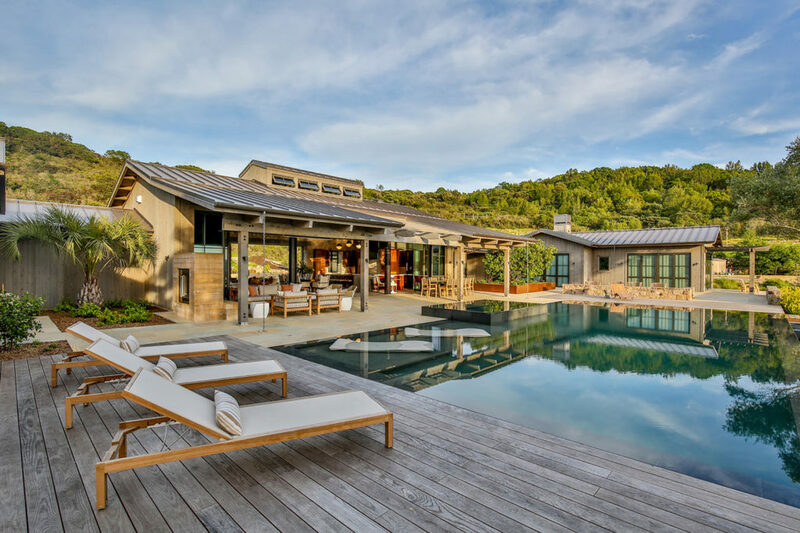 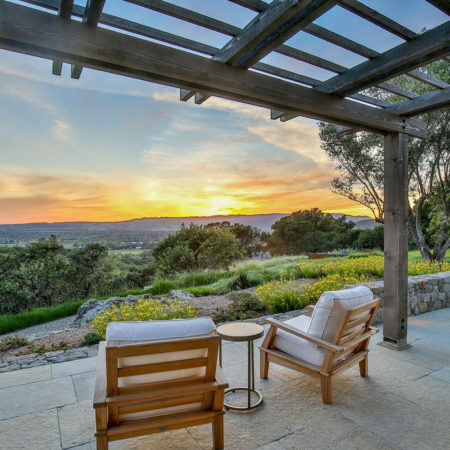 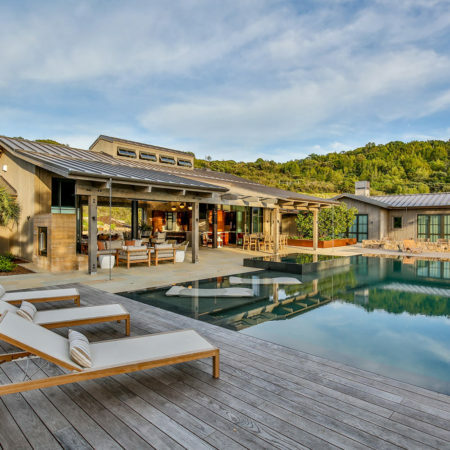 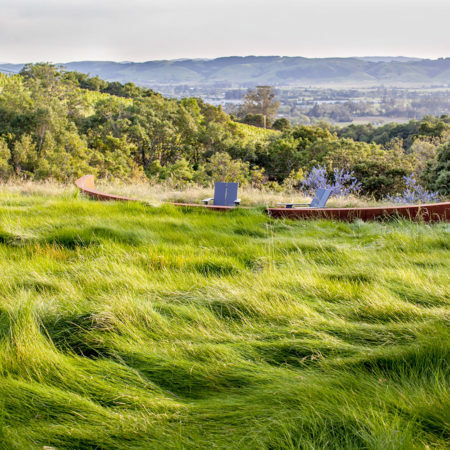 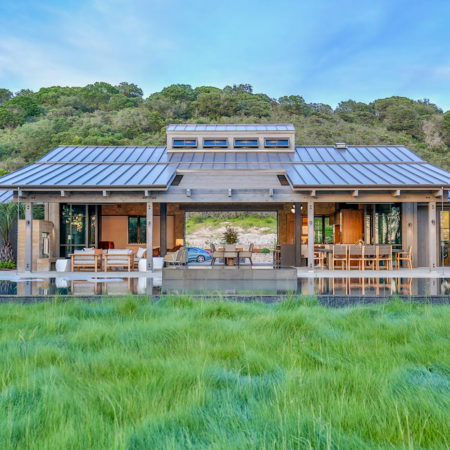 This weekend wine country getaway and eventual retirement home for a busy Bay Area executive and his family sits on 15 acres of a southwest-facing slope just east of the town of Sonoma. 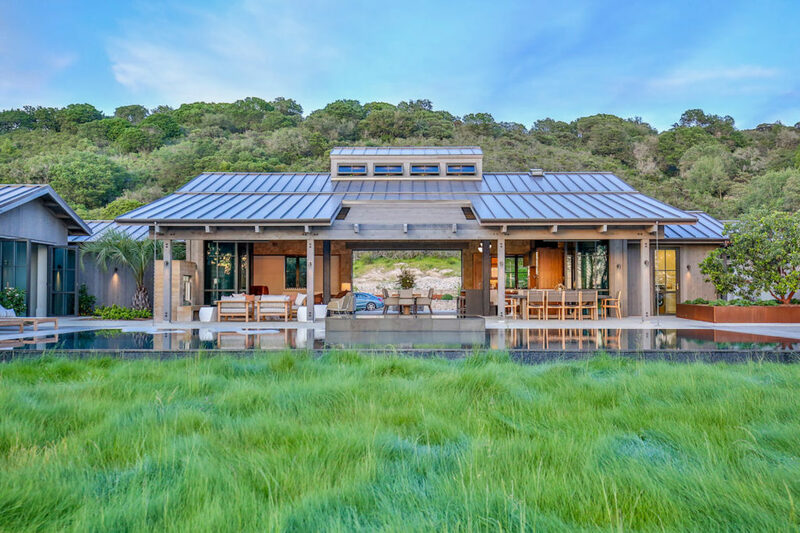 The mostly steep, wooded site featured an existing deer-fenced 3.5-acre vineyard with access road and well, but no other development. 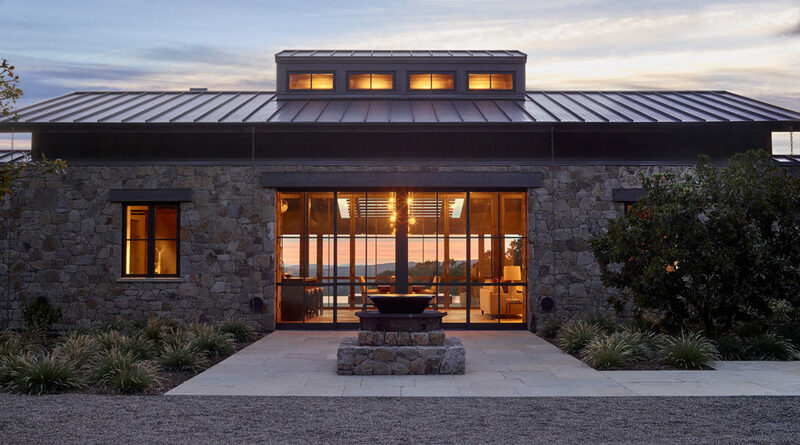 To create enough usable level land capturing the views while meeting the County’s viewshed ordinance, the top of a rocky knob, playfully referred to as ‘Pride Rock’, was removed and stockpiled for future use. 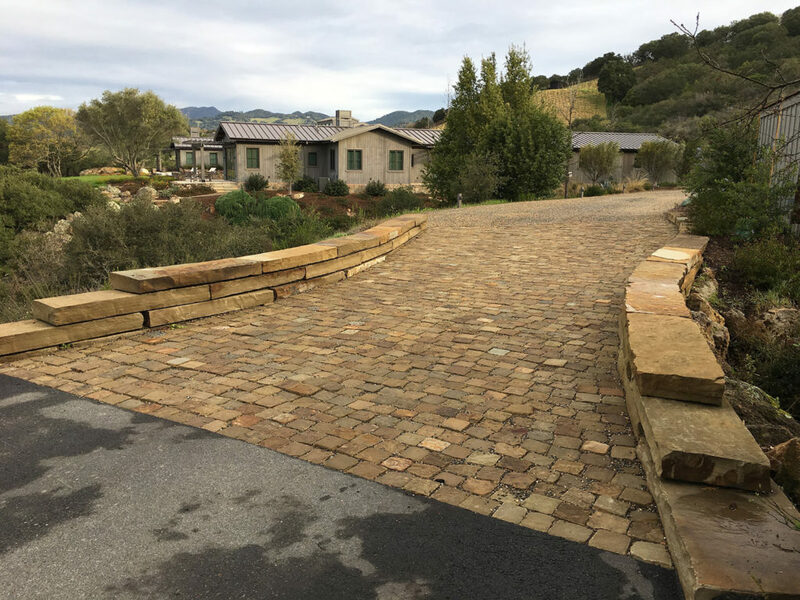 The two existing oaks that had to be removed were replaced with specimen olives of equal size to maintain the needed screening from the valley floor. 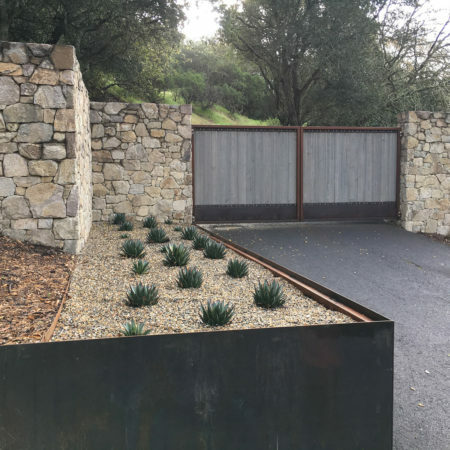 A meadow of Creeping Wild Rye spotted with Upright Verbena and Showy Milkweed flank the stone walls and steel and wood entry gates at the bottom of the property. 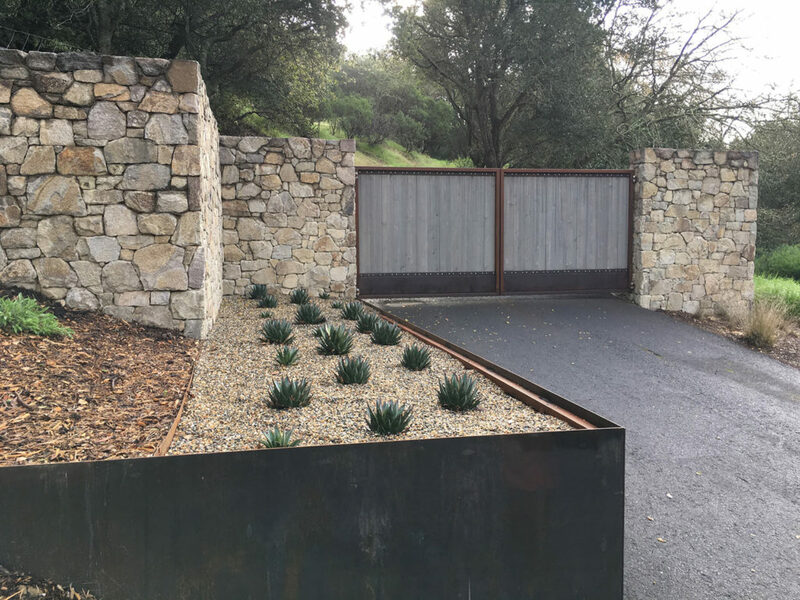 Here the first of a series of raised rusted steel planter elements houses the mailbox, street address and a planting of Agave ‘Blue Glow’. 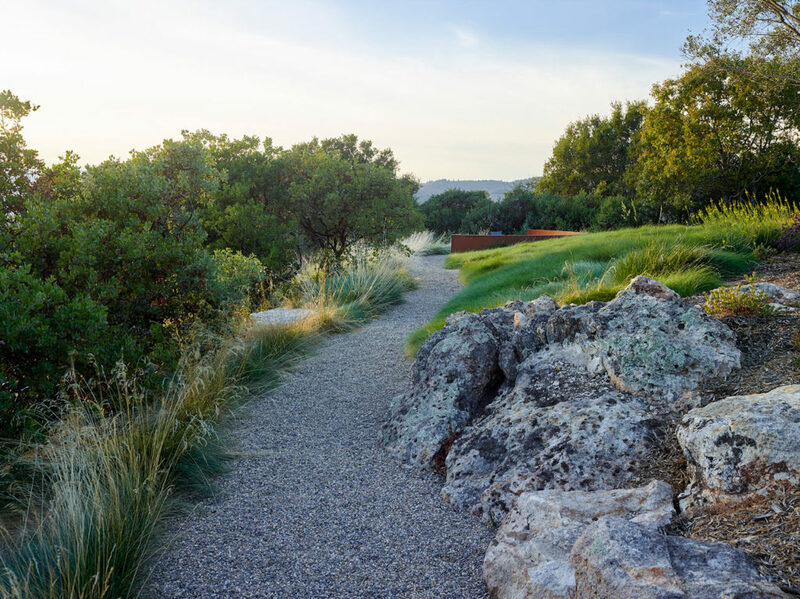 The steep access drive winds through oaks up the hill until the vineyard is reached. 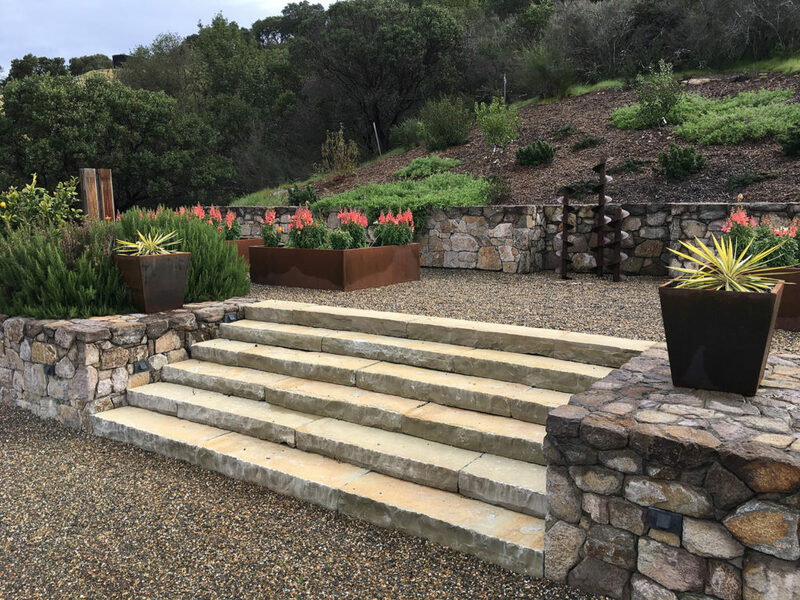 Between the drive and the vineyard, an insectary garden of California native plants attracts and hosts beneficial insects, birds and reptiles. 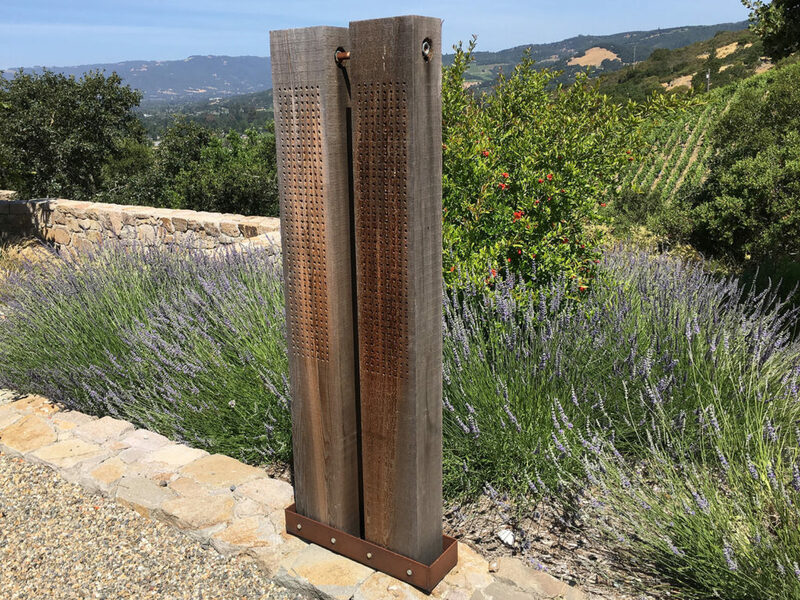 The Hungry Owl Project was brought in to place owl boxes and bluebird houses to provide natural control of unwanted pests. 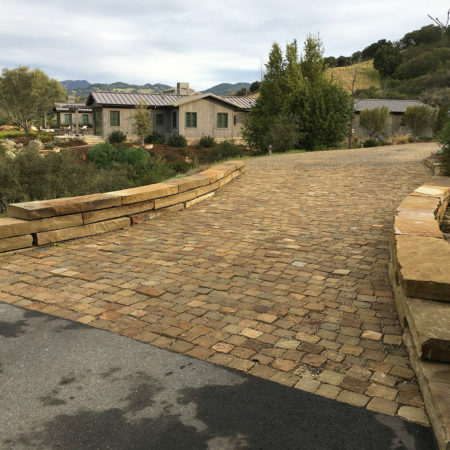 A ‘bridge’ of stacked stone slabs and stone cobble announce arrival at the compound as guests cross the first of two existing seasonal drainages that pass through the site. 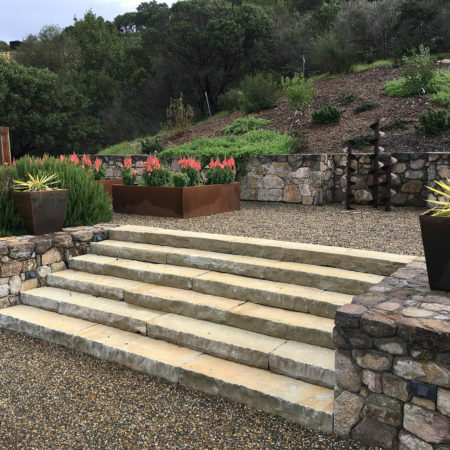 Both were preserved and enhanced using boulders stockpiled during construction, and California native riparian plant material. 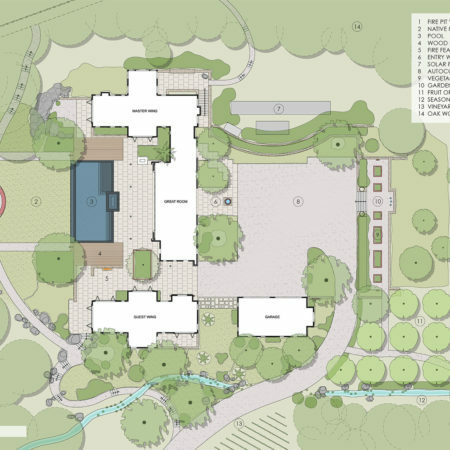 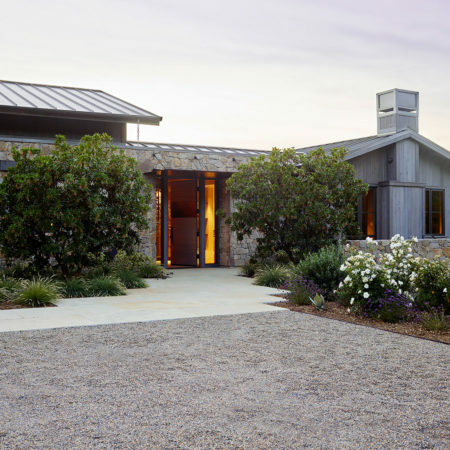 At the bridge, the entry drive transitions to gravel and leads into a gravel auto court which serves the detached garage and the carport, provides fire access and guest parking, and doubles as a casual pétanque court. 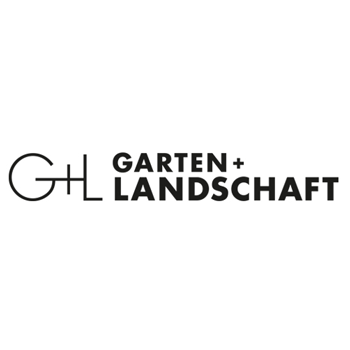 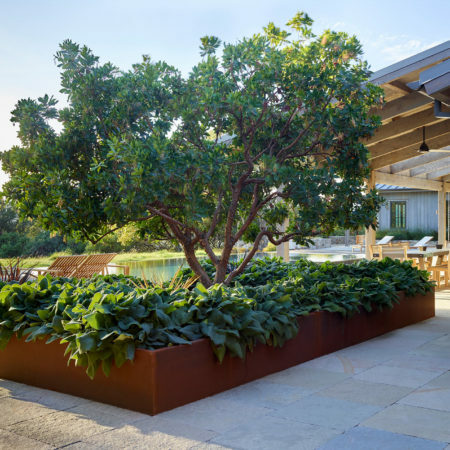 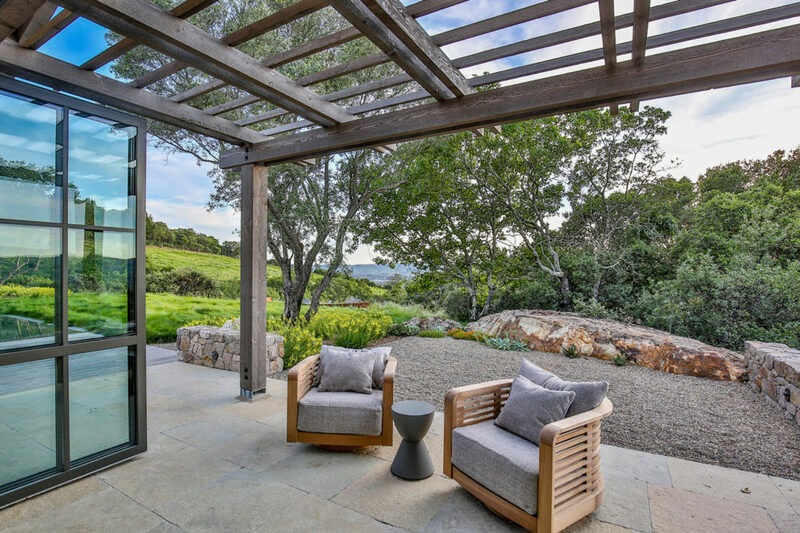 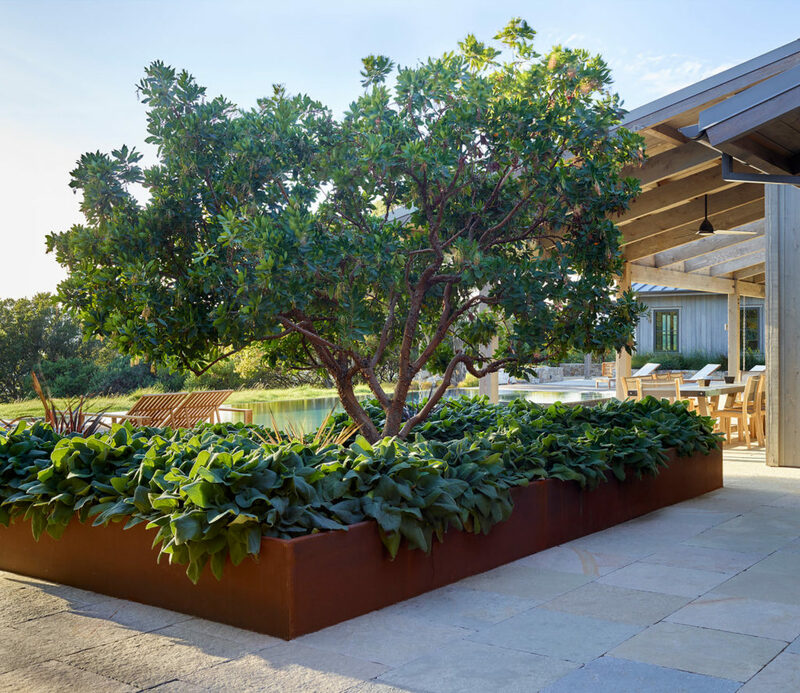 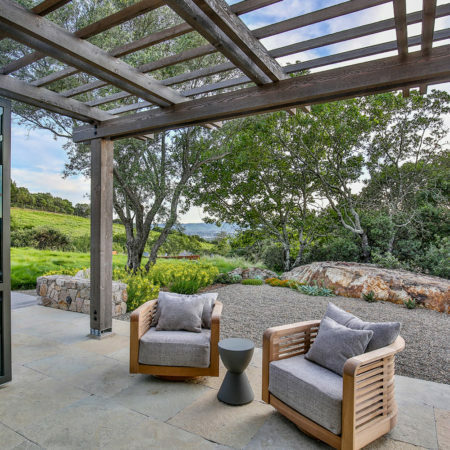 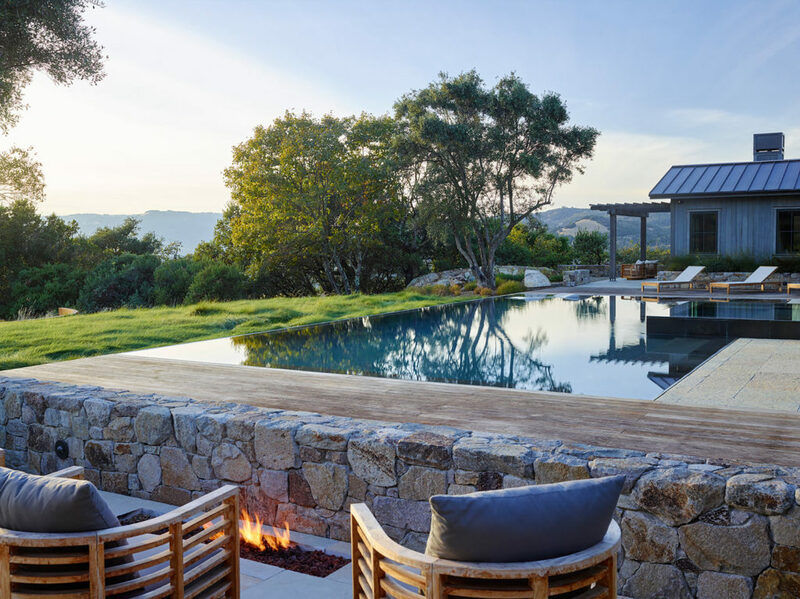 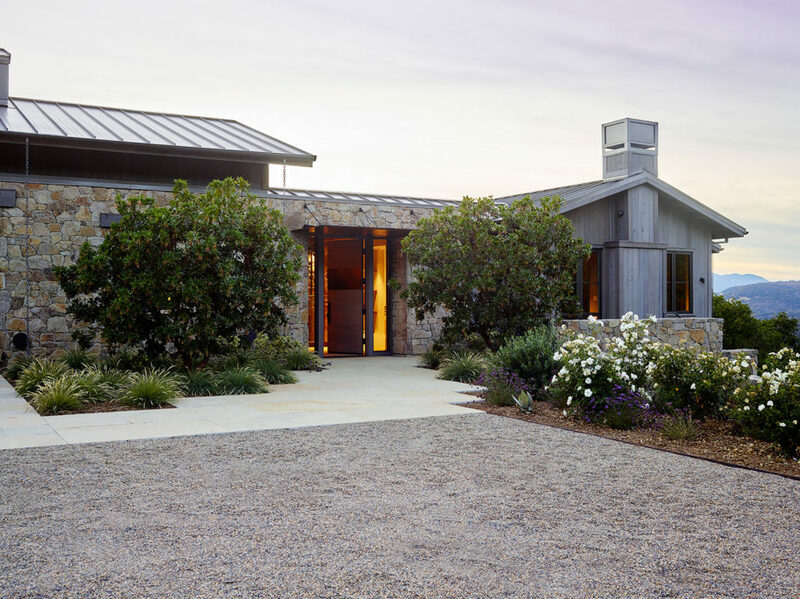 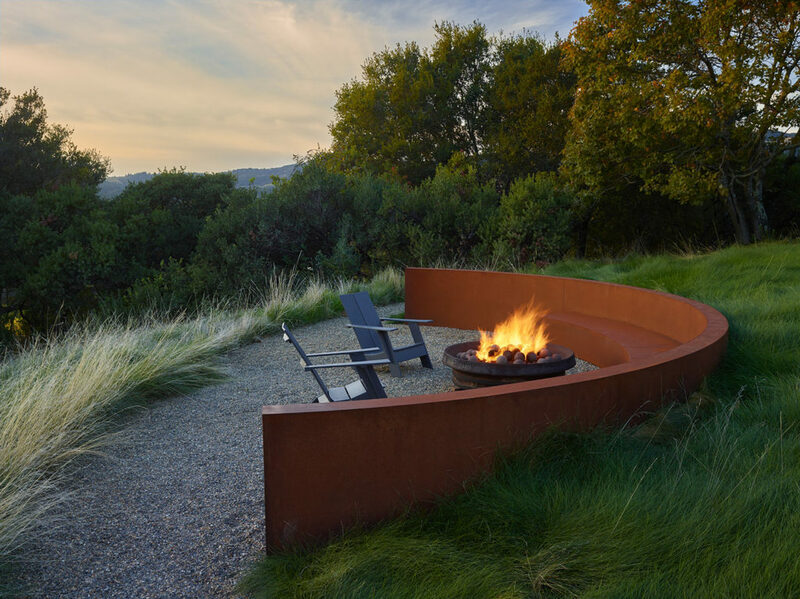 Across the autocourt at the base of the existing Manzanita and Chamise slope and hidden by a citrus hedge, stone walls create a gravel vegetable garden terrace featuring raised steel beds, and a custom water feature using reclaimed steel augers. 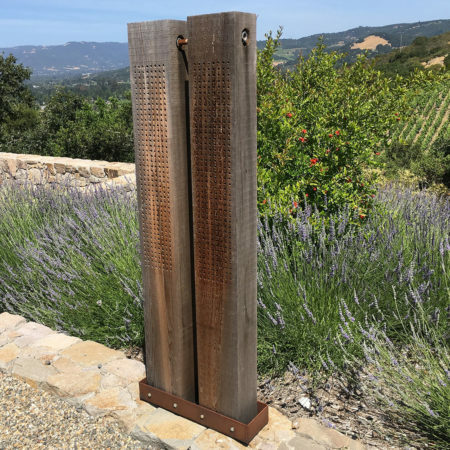 At each end of the garden, custom wood and steel ‘bee hotels’ were designed to accommodate the native nesting bees, to pollinate the garden and adjoining fruit tree orchard. 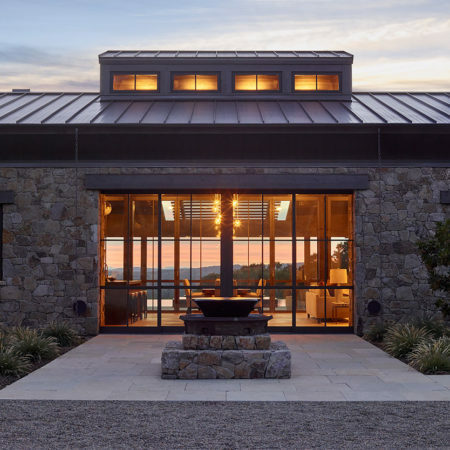 The compound of refined rural vernacular buildings featuring locally quarried stone veneer and standing seam steel roofs lays out mostly on one level, with master and guest wings flanking a central great room with vaulted roof and oversized glass doors that tuck into pockets to allow true indoor-outdoor living. 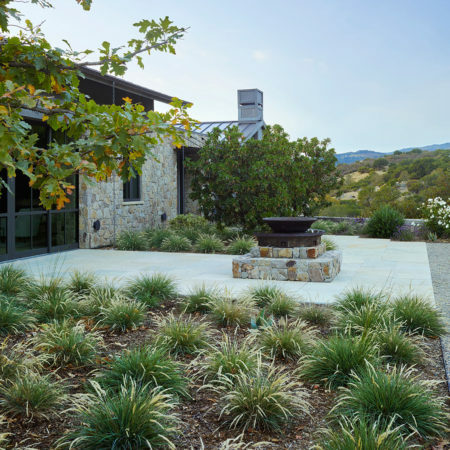 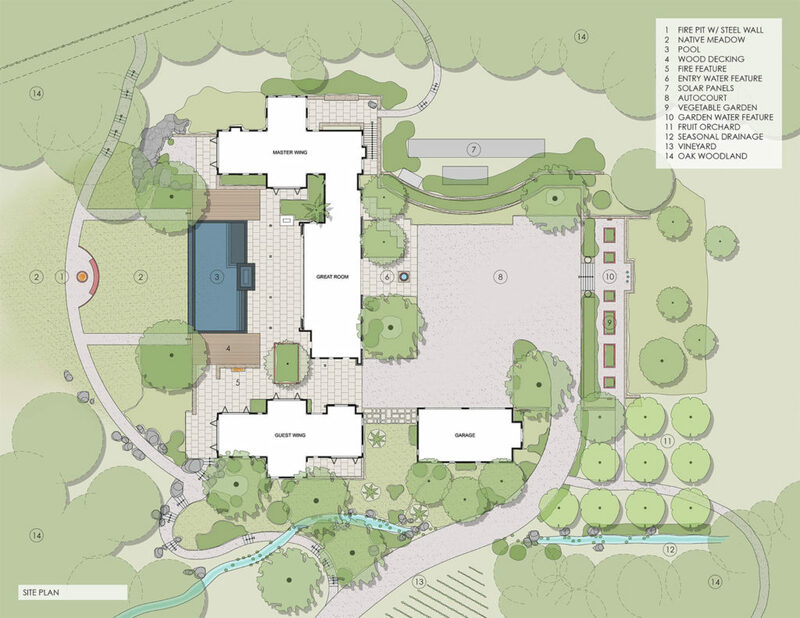 The rear garden features multiple gathering spots, including the covered outdoor dining, and outdoor fireplace seating nearest the house, and a linear gas fire pit and stone seat walls outside the guest wing. 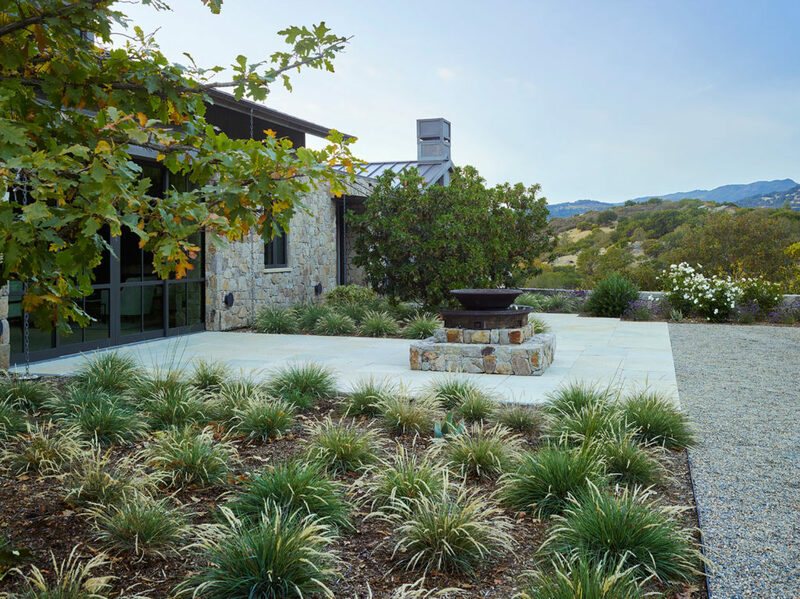 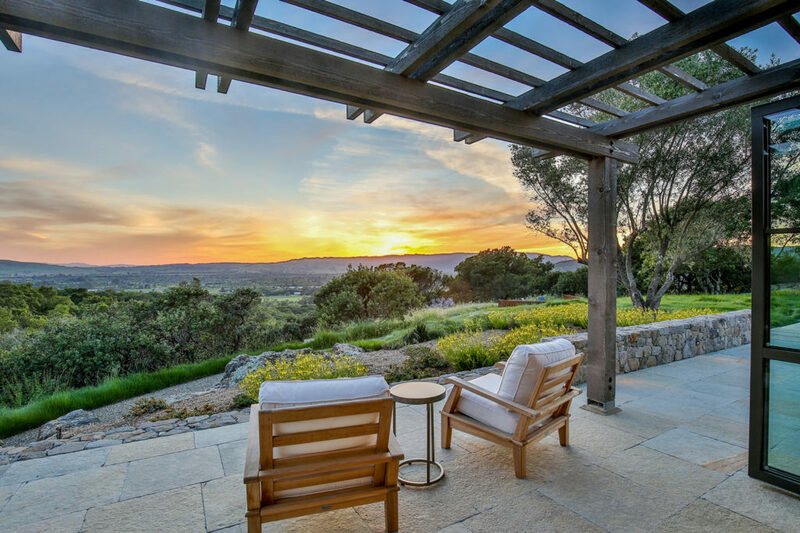 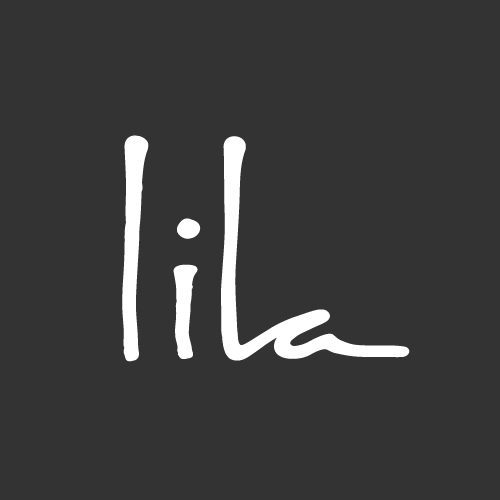 Outside the master bedroom, an intimate gravel terrace with Aloe striata and native Dudleyas runs to the foot of an existing rock outcropping bristling with tiny native succulents. 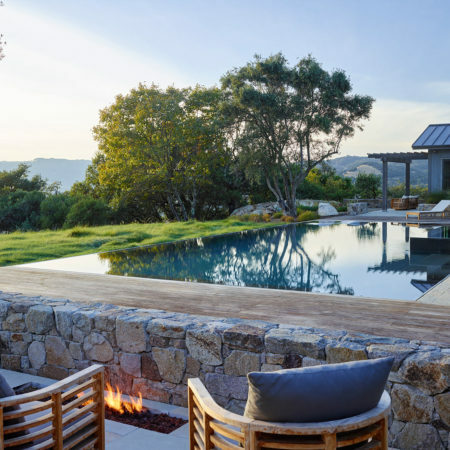 At the heart of the rear garden, the perimeter overflow pool is rimmed with dark grey basalt and features a dark pebble finish interior, to create a flat mirror-like plane that reflects the sky and clouds, and leads the eye to the valley views beyond. 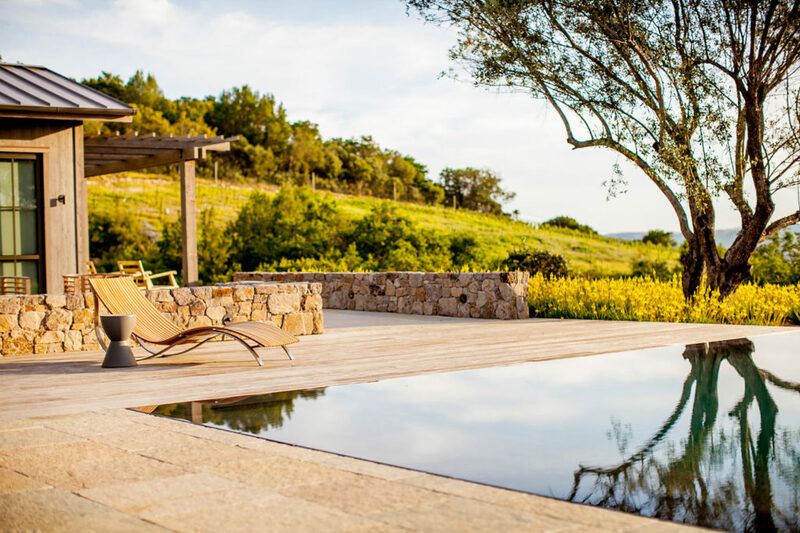 The slightly raised spa and the infinity edge are veneered with the same stone but feature a saw-tooth chiseled finish to create more visual interest as the water runs down its face. 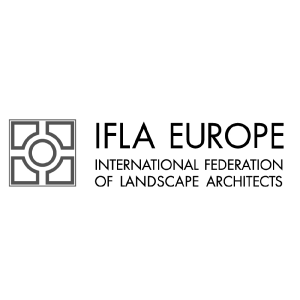 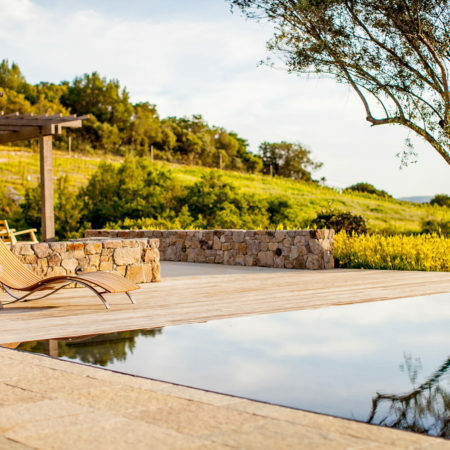 Running bond limestone terraces and farmed American ash decks with chaises flank the pool. 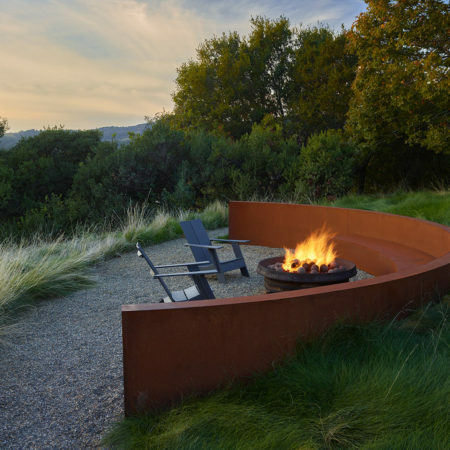 An arcing gravel path leads from both ends of the house past native rock outcroppings to a curved custom steel retaining/seat wall and gas fire pit fashioned from reclaimed quarry equipment, all set into a native meadow of Purple Needle Grass downslope of the pool. 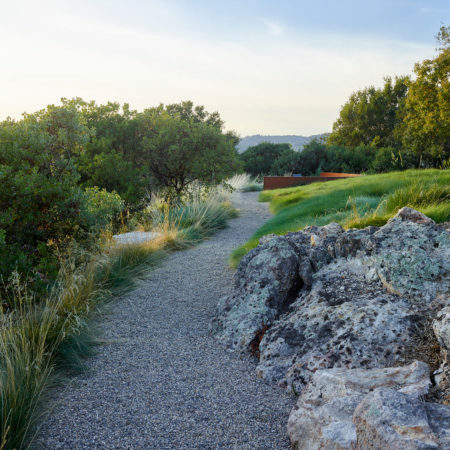 These paths lead to a two-mile loop of walking/hiking trails designed and established to allow the clients to fully utilize and explore their property.